With more than 41,000 attendees and 1,200 exhibitors in attendance, there was no shortage of activity at the annual Health Information Management Systems Society (HIMSS) Annual Conference and Exhibition in Las Vegas last week. Even though it seemed like everyone in the healthcare industry was rushing from session to session and booth to booth at the show, we realize that not all medical group professionals were able to join the frenzy in Sin City. That’s why we’re providing this round-up of the most important news from the show. Value-based care is on the way, but are you ready to jump in? While healthcare organizations are adopting various forms of value-based payment models, only three percent of the 102 respondents in the 2016 HIMSS Cost Accounting Survey believe their organization is highly prepared to embrace pay-for-value models. "As the industry moves to a more patient-centered, value-based system, it is exciting to see providers embracing this change," said Pam Jodock, senior director, Health Business Solutions at HIMSS. "But if we are to realize the projected cost savings of moving from fee-for-service to pay-for-value we will need to act in a thoughtful way when building the infrastructure and business processes to support these new payment models. The findings of the 2016 HIMSS Cost Accounting Survey identify what providers perceive their top needs to be in transitioning towards pay-for-value as well as highlighting areas of opportunity for the industry to help providers make a smooth transition. For example, it will be critical that the industry reaches some level of consistency in terms of how providers should manage the exchange of clinical and financial information between all parties involved in an episode of care, regardless of whether or not they are part of the same healthcare delivery system." Connected health has landed – and it has staying power. More than 50 percent of respondents in the 2016 HIMSS Connected Health Survey said their organizations currently use three or more connected health technologies. Respondents found these technologies to be quite valuable – as they said that the connectivity positively affects communication with patients as well as the ability to deliver improved care. What’s more, 69 percent of respondents agreed that patient portals help them send and receive data securely. "The healthcare ecosystem is increasingly converging on patient centric technology solutions," said Tom Martin, Ph.D., director of healthcare information systems for HIMSS. "The role of the provider is to expand far beyond the walls of the exam room, especially as our healthcare system transitions towards value based purchasing. The Connected Health findings illustrate the importance of interactive relationships between physicians and individuals and technology as a means to advance comprehensive health and healthcare." Patients are demanding a digital care experience – and they are ready to embrace digital tools and electronic health records, according to the 7,840 consumers ages 18+ who participated in the Accenture 2016 Consumer Survey on Patient Engagement. The study served to assess attitudes toward health, the healthcare system, electronic health records, healthcare technology and healthcare providers’ electronic capabilities. To improve patient engagement and customer satisfaction, healthcare organizations must close the gap between what patients demand and what providers deliver by investing in digital tools and strategies, according to the study. The fact that patients are embracing EHRs in record numbers indicates that there is a healthy appetite for technology. In fact, 45 percent of consumers with EHRs accessed their records electronically in 2016, compared to just 27 percent in 2014, according to the Accenture study. Interestingly, users age 65 to 74 were moist likely to have turned to their EHRs to manage their health (38% did so in 2016 vs. just 22% of those aged 18 to 34). Patients who have accessed their EHR are primarily doing so to stay informed (41%). Very few (6%) are consulting the EHR to make medical decisions. Among consumers who know what information they have access to, 41 percent said accessing lab work and blood test results is most helpful for managing health, while 24 percent said having physician notes is most helpful. Good but maybe not good enough -- yet. “These commitments are a major step forward in our efforts to support a healthcare system that is better, smarter, and results in healthier people,” Burwell said. Meaningful Use is not dead in the water. Healthcare IT solutions will soon be reviewed directly by the Office of the National Coordinator for Health IT (ONC), according to a proposed rule change introduced during the HIMSS16 conference. The change is designed to ensure that medical record sharing becomes a reality. The proposal would allow ONC to directly review certified EHRs and other health IT products and address potential safety risks and other problems. More specifically, ONC could initiate a direct review anytime it learns of information that suggests certified health technology “may not conform to the requirements of its certification or is, for example, leading to medical errors, breaches in the security of a patient’s health information, or other outcomes that are in direct opposition to the National Coordinator’s responsibilities,” according to the proposed rule. What’s more, under the proposed rule, ONC would have the ability to oversee health IT testing entities, in alignment with current oversight of ONC-Authorized Certification Bodies. “Today’s proposed rule will help us ensure that health IT products and the health IT marketplace are continuing to meet the needs of the health care system,” ONC Coordinator Karen DeSalvo said in a statement. Doctors want better technology and it’s time to give it to them. That was the message from CMS Acting Administrator Andy Slavitt, who spoke during a joint keynote session with Karen DeSalvo, MD, National Coordinator for Health IT. Slavitt said that CMS has been collecting feedback on technology needs from physicians on the frontline. This input has led to three conclusions: physicians are hampered by the lack of interoperability; regulations in their current form slow physicians down due to documentation burdens; and electronic health record technology is sometimes cumbersome. Slavitt also pointed out that, even though the proposed Medicare Access and CHIP Reauthorization Act (MACRA) rule is still a few months away, CMS is working to ensure that public policy closely meshes with patient care. As such, CMS is working to give physicians more flexibility when it comes to technology implementation and to focus on outcomes, instead of just activities. 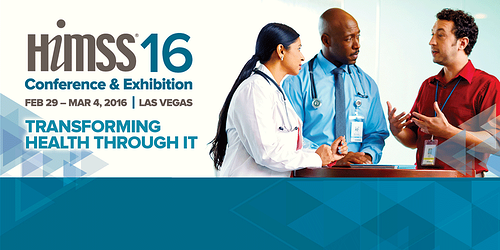 HIMSS Analytics unveiled new criteria for its Electronic Medical Record Adoption Model at HIMSS16. The HIMSS Analytics EMR Adoption Model (EMRAM) is an 8-stage model that measures healthcare organizations on their progress towards achieving the ideal paperless patient record environment. Internationally recognized as the industry-standard, the various stages of the EMRAM assess the extent of health IT adoption and optimization achieved by healthcare provider organizations. The updated criteria moves some of the technology and practice benchmarks to different stages; accounts for various differences in global healthcare delivery; and adds new security measures. A quarterback’s take on it all. Making one of his last appearances before announcing his retirement, Peyton Manning, National Football League's (NFL) only five-time Most Valuable Player (MVP) and a 14-time Pro Bowl selection, joined Robert A. Heyer, MD, president of the NFL Physicians Society and team physician for the Carolina Panthers, to deliver the closing keynote at HIMSS16. Peyton spoke about leadership, teamwork and battling through adversity. And, as a quarterback who has been injured often, he reminded everyone in the audience of all the good work that they do. “Doctors, nurses and staff each perform individual roles. But unless they work together, and the IT systems provide critical intelligence, patients will suffer a less than optimum outcome," he said. While the HIMSS conference presents an annual opportunity to keep up with all the emerging innovation and regulatory changes in the healthcare industry, we are ready to help your practice get the most out of technology year round. To find out how RevenueXL can help your practice improve care and enhance operations, contact us today.